I have been bookkeeping and managing small to medium size construction companies for 12 years and one thing that they all have in common, be they landscapers, concreters, earthmovers, builders or such is that they all do a days hard labour outside in whatever elements the season brings and then go home, sometimes after a 12 or 14 hour days, and sit at the kitchen table to catch up on their paperwork. Sounds familiar? One of my goals in working with these companies is to increase their efficiency, enabling them to spend more time drumming up business and less time chasing a paper trail. 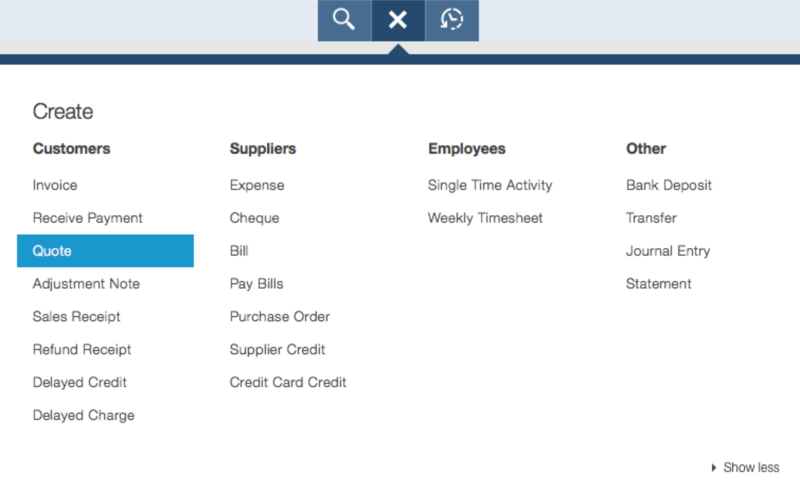 One of first things that I introduce to new clients is the “Quoting” feature in Quickbooks Online. This feature works across devices like Android phones, iPad, iPhone, PC and Macs. While my customers are on site talking to the potential clients about a job, they can work with the client then and there to prepare a quote, have the client sign their acceptance and email a copy of the quote, all without ever picking up a pen let alone an unnecessary trip to the office. What amazes my tradies is not only the time they save by adopting this process but the fact that they can also take photos of the job site or any contract documentation and upload them to the quote so that this data is kept where its supposed to be and not rolling around on the floor of someone’s Toyota Hilux. They then enter the new customers details or select an existing customer. 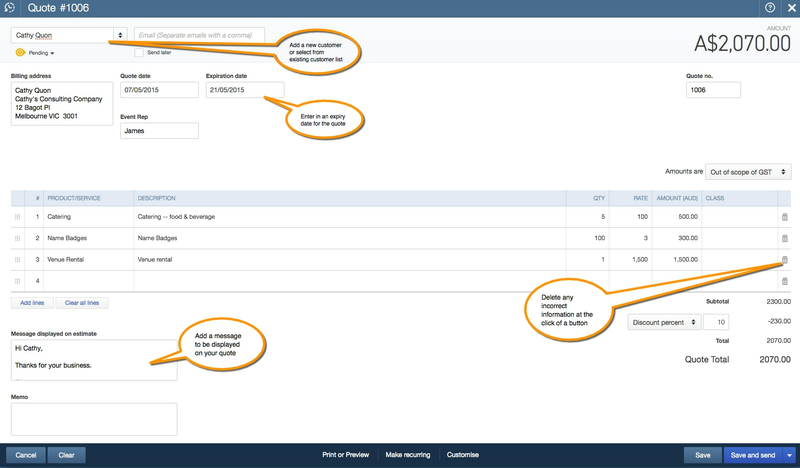 Fill in the quotation details including amounts, add any clauses to the message field and upload their attachments resulting in a feature rich quote. How detailed you make the quote is up to you. Another great feature is that you can revisit the quote at a later stage and mark it as either, accepted, closed or rejected. Once accepted the quote can easily be transferred to an invoice. One of the most common complaints that I hear from my construction clients regarding quotes is how much time and money it takes them to put the quote together. They visit the job site to determine the clients needs, go away, research costing and send the customer the quote. Often it may only be one in every ten quotes priced that they win. My advice to combat the customers price shopping is to seal the deal on the spot or make an appointment to visit the customer face to face to deliver the quote. 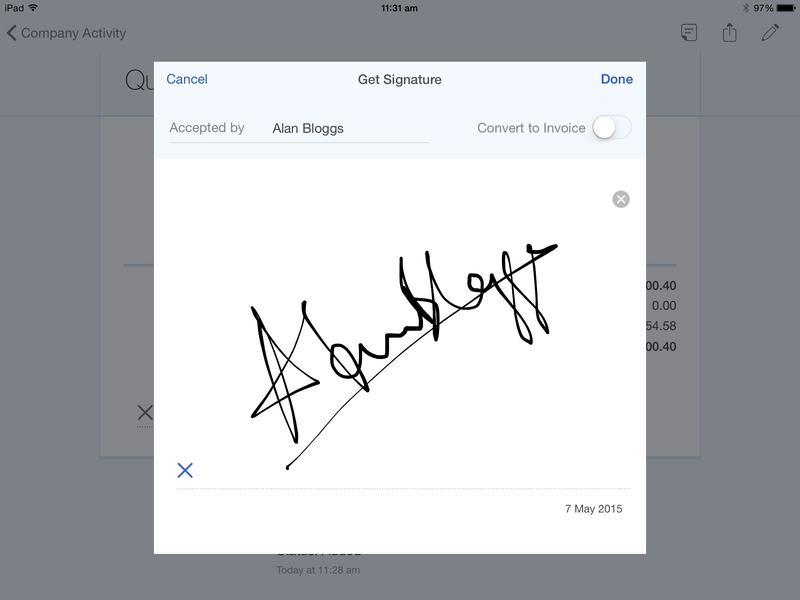 The “Quotes” Feature in Quickbooks Online assists with this process by enabling the customer to sign off on the quote directly on the tablet! With Three clicks (this even includes signing in!) you are customising a quote for your customer and unlike Quickbooks Online competitors you also have the option of uploading up to 5 MB of photos or documents to the quote and keeping all of your customer notes or correspondence back and forth tightly tucked within the quote. 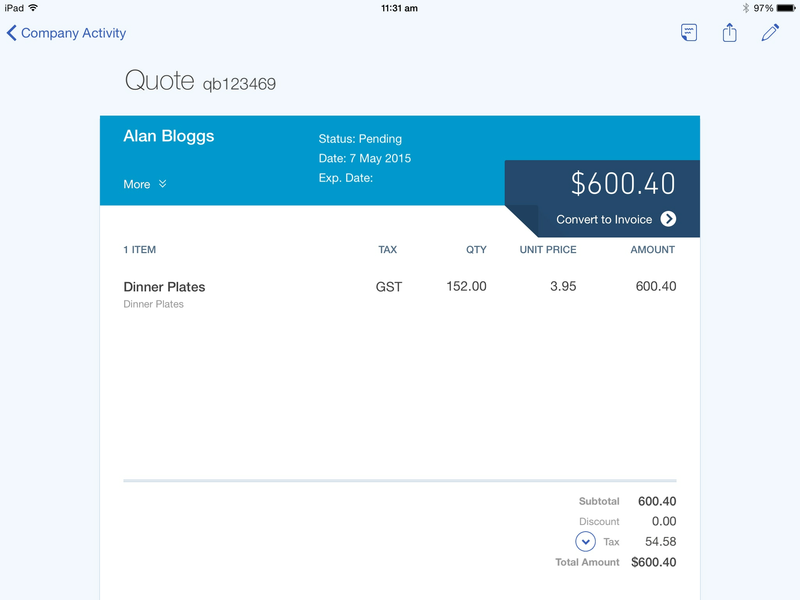 The Quickbooks Online Mobile App is visually open, crisp and clean, the app is free and super easy to navigate and all information gets synced automatically with your other devices, so as soon as my customer has saved the quote 135 kilometres away from my office, I can see it on my computer along with pictures of the job site and any scope documents. If my customer doesn’t have a tablet or can’t afford one, that’s ok, they get the same deal from their smartphone! I find on average that the process not only saves time and increases professionalism but to my customers the tablet has become like a third hand and there is no way they would ever go back to manually writing quotes.